Based on the cognitive computing software Cogito, Cogito Discover is Expert System’s software for text analytics that leverages full comprehension of what is contained in your knowledge base to ensure that the content of unstructured information is available for insight for strategic and operational analysis and is easily findable in your knowledge management, information intelligence and process automation applications. Traditional systems that use keywords are incapable of reading text or understanding language in emails, text documents or web pages; therefore, they miss a great deal of important information. 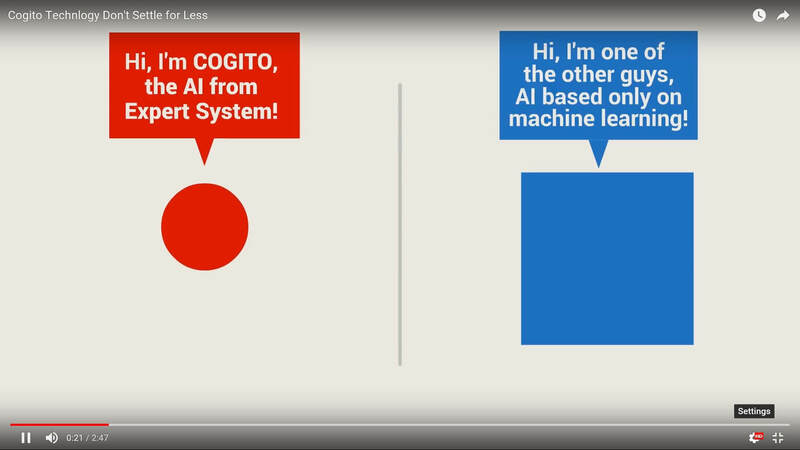 Instead, a technology that knows where every piece of information is and can fully understand text like you do can easily address this complexity: this is Cogito Discover. Cogito Discover is a powerful and scalable semantic content enrichment, categorization, entity extraction and text analytics software that recognizes and identifies relevant items of information hidden in text and enriches document metadata. It embeds syntactical, statistical, taxonomy-based and information extraction engines and supports many languages, enabling it to power high-throughput extraction applications across a wide range of use cases and geographies. With Cogito Discover, focus your attention on the organization of content rather than on the content to be managed. Understands through the application of multiple comprehensive analysis tasks: It reads the content, understands the context, concepts, entities and relationships within, and it comprehends what is contained in content much the way a person would. Classifies: Cogito Discover achieves extraordinary precision and granularity that can be directly applied to the automatic classification and categorization of the content of any taxonomy, with outstanding results. Identifies and extracts entities contained within content: General interest entities such as people, places, locations, organizations, URLs, email addresses, phone numbers, groups, dates and values or more domain-specific entities such as proteins or genes in a biology context. Cogito Discover can also extract links and relations between entities (for example: a merger between two companies or a chemical reaction between two compounds), including the roles played by entities in the relation, their attributes and any other contextual information mentioned in content. Dramatically improves analytics: Cogito Discover is able to dramatically improve text analytics efforts, enabling descriptive, prescriptive and predictive models to utilize valuable insight and knowledge previously hidden and unused in unstructured formats. Try Cogito! Start your live demo now! Cogito Discover produces all that is discovered as XML, RDF and other formats so the systems and assets that cannot read can incorporate the value contained in unstructured content. Cogito Discover offers an easy integration path into any application or workflow, enabling rich integrations that work hand-in-hand with content management systems, portals, search engines, archival and case management platforms, editorial workflow tools, and applications to enhance their capabilities including: Microsoft SharePoint, Marklogic, Google Search Appliance, SalesForce and more. The Cogito Discover architecture is reliable and highly scalable for the number of users and documents, and may be easily adapted for different operational contexts.